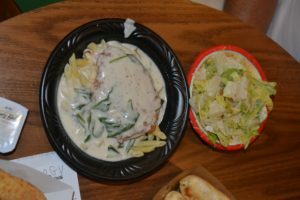 Disney’s Pinocchio is a classic, and it’s Magic Kingdom dining counterpart is just as classic. The Pinocchio Village Haus is a Quick Service restaurant in Fantasyland in Magic Kingdom that offers a mostly Italian menu. It’s an old reliable for our family since you really can’t go wrong with pizza. The Pinocchio theming is fun, and there are large murals on the walls of some of the characters from the movie. 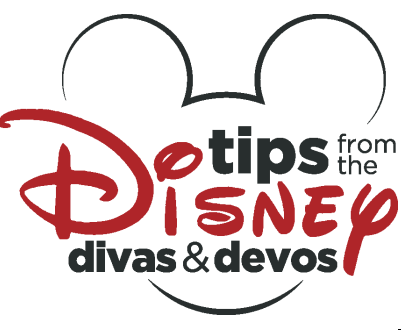 On a recent trip to “The Most Magical Place on Earth” we enjoyed dinner there, and I have chronicled our experience here. Pinocchio Village Haus has lots of seating with various small dining rooms spread out around the restaurant. But it is usually very crowded so getting a table can be tricky…especially when it’s pouring down rain like it was when we were there last. Like most Disney quick service joints, guests stand in line to place their order with a cast member at a kiosk and then they are ushered to a counter to wait for their order to be ready. However, I have a recently discovered food sensitivity, so when I asked a cast member for an allergy menu, I was informed that we would receive a buzzer instead of waiting for our food at the counter. We placed our order, received our buzzer, and then went on the hunt for a table with diners who looked like they were nearly done eating so we could circle them like a bunch of buzzards until they got up and we could pounce. Shortly after finding a seat, our buzzer went off. My husband got up and met a cast member who was helping him bring the trays to the table. My husband ordered something very out of character for him–chicken penne alfredo and an order of breadsticks with marinara sauce. The alfredo is no longer on the menu, but it came with a Caesar side salad. The sauce appeared to be creamy, and the chicken was a pretty standard piece of breaded chicken like you would see with Chicken Parmesan–which appears to have replaced the alfredo dish. 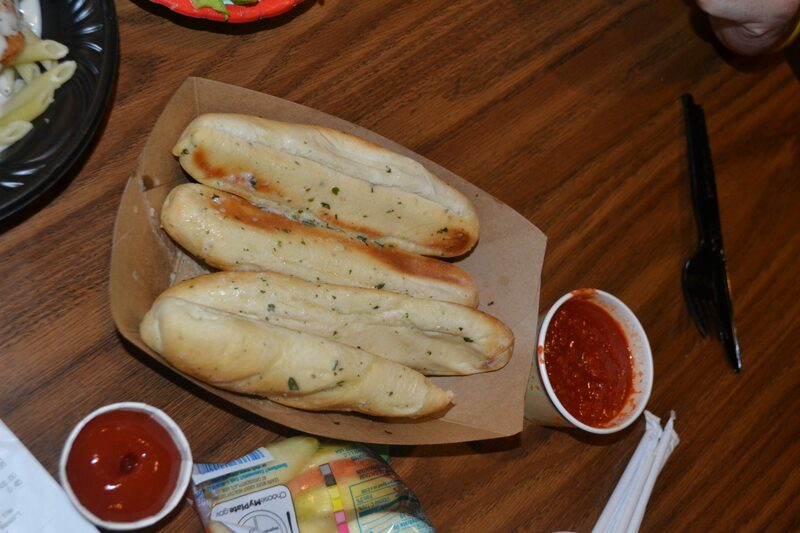 The breadsticks were warm, and the sauce was flavorful. Overall, this was a very filling meal. Each of my kids ordered a Kid’s Flatbread Pizza which came with a drink and a side. One kid wanted apple slices, and the other child wanted a yogurt, and they each chose a bottled water as their drink. 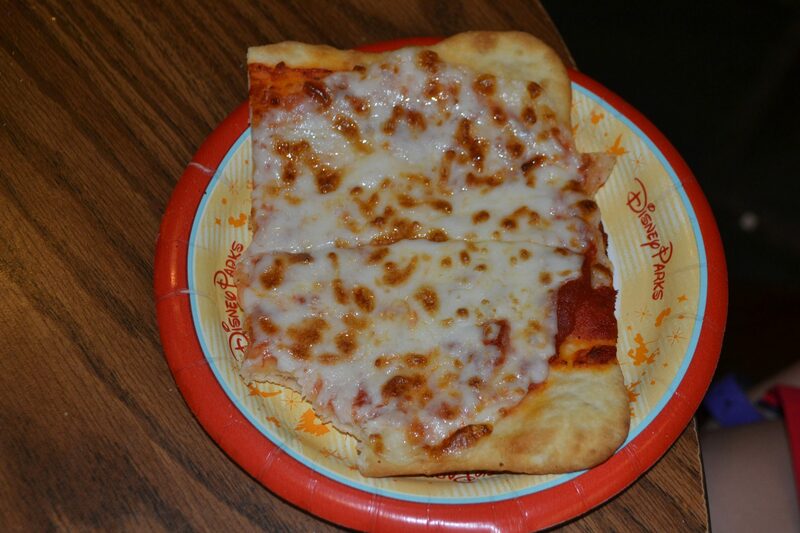 The flatbread is pretty standard Disney pizza. It’s a no-fail, kid-friendly item. 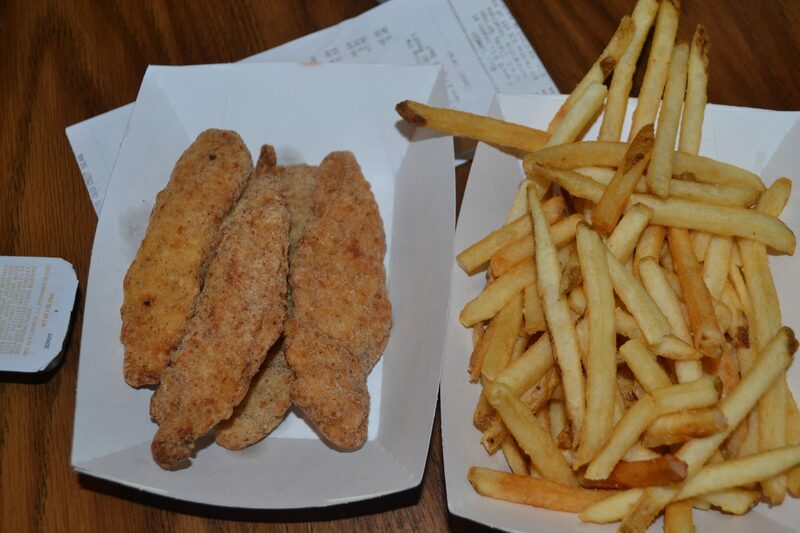 With my gluten sensitivity, I ordered the allergy friendly chicken strips and fries. I had already had the gluten free Flatbread Pizza from The Mara at Animal Kingdom Lodge during an earlier trip, and I wanted to try something different. They did not disappoint…crunchy, flavorful, and really filling coupled with the fries. It had been a long time since I had had any sort of “fried chicken” so I was pretty easy to please. We also ordered a Blue Raspberry Slushy which is out of the ordinary for us. 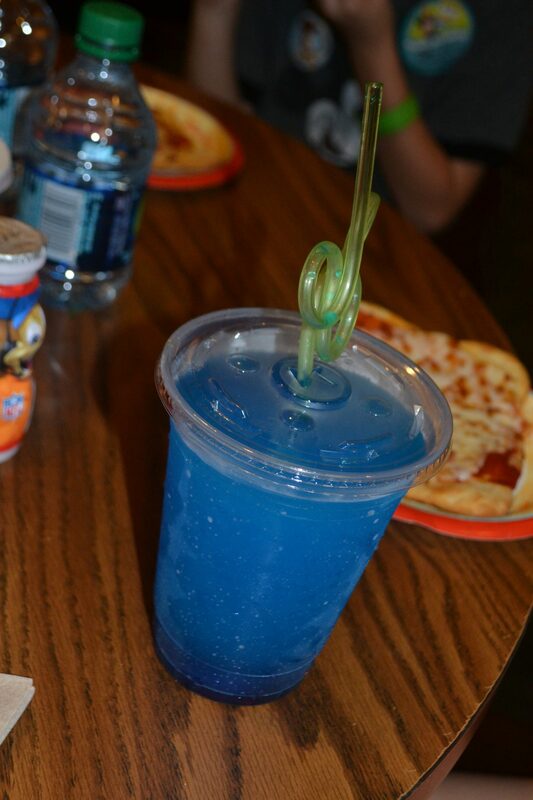 We usually stick to drinking water, but it had been a long, hot day, and that ice cold slushy was calling my name. It was so, so good, and I would not hesitate to get one again after a hot day of park touring. Pinocchio Village Haus is located in Fantasyland at the Magic Kingdom near Prince Charming’s Regal Carousel. It is directly next too “it’s a small world” and if you can score a seat, there is a viewing area where you can watch the riders board their small world boats while you dine. There are bathrooms inside the restaurant which is convenient, and there are two entrance and exit doors to help move the consistently heavy flow of traffic in and out of the restaurant. Pinocchio Village Haus accepts the Disney Dining Plan, and meals will cost one Quick Service credit. 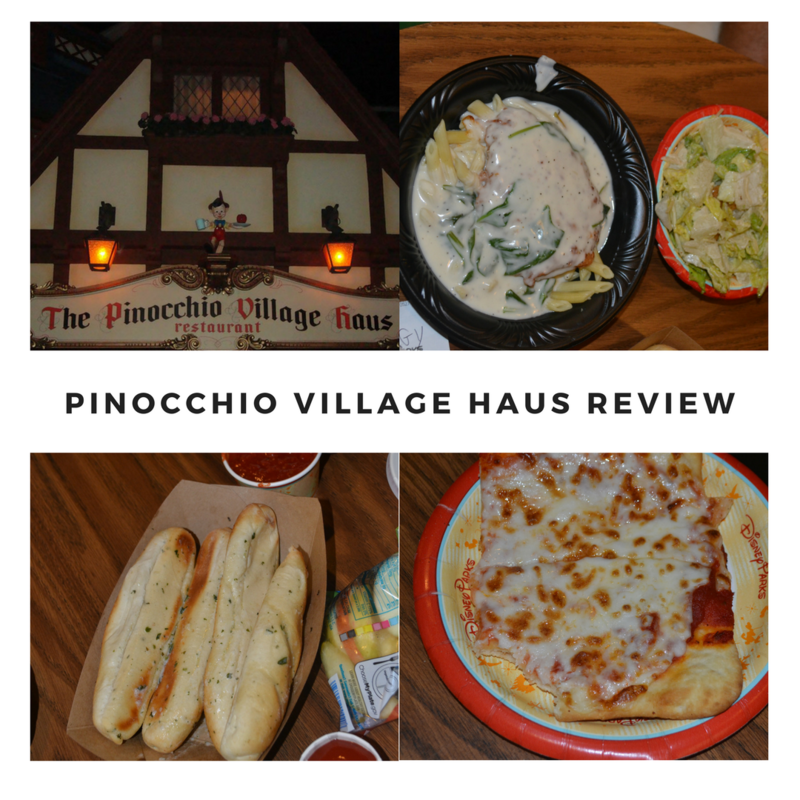 Next time you are at Disney’s Magic Kingdom, you should give Pinocchio Village Haus a try. I don’t think you will be disappointed. Ready to book your next vacation? Contact Patricia at All For Dreams Travel for FREE help planning your trip! 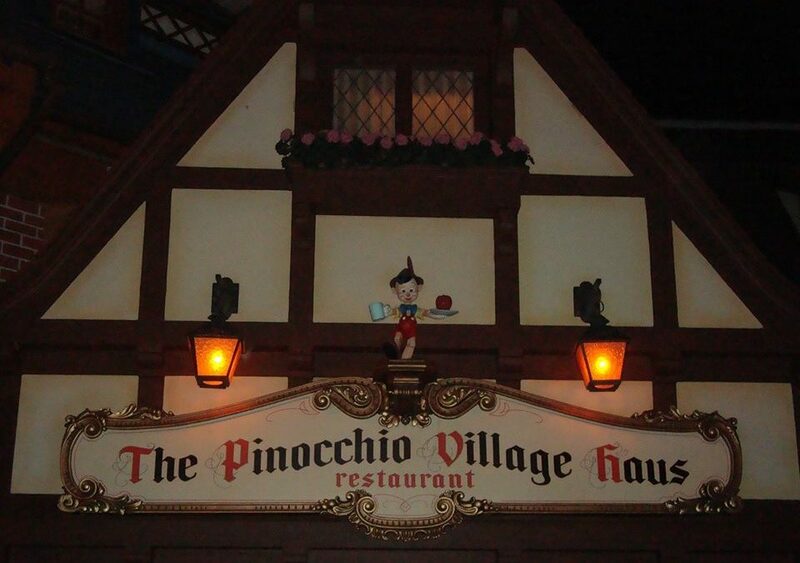 Photo credit to Dopey Diva for the photo of the exterior of the Pinocchio Village Haus. I am a Disney-loving former second grade teacher turned stay at home mom of two kids whom I homeschool and the wife of a Disney-tolerating husband. (But I think I am slowly starting to convert him!) If I'm not at Walt Disney World, you can probably find me planning my next Disney vacation or day-dreaming about being in the Magic Kingdom. I also love monograms, reading, Sonic Cherry Limeade's, autumn, and teaching kid's church.